How many fellow photographers have had beautiful landscapes that just lacked a certain – je ne sais quoi? – a certain something? 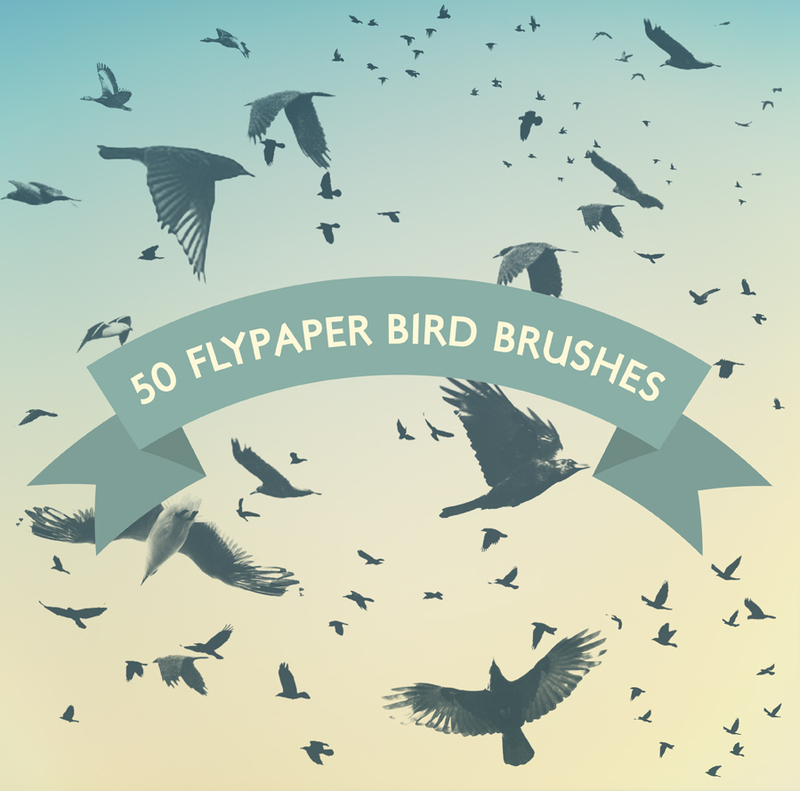 Well now flypaper textures can help you out yet again with our brand new Bird Brushes! Welcome to our second Brush set, this time we have Birds! All kinds of birds, flying, standing, perching on wires and in trees, ducks and geese flying in formation and several skies full of starlings! We’ve already used several brushes over the past few months in trials and the feedback has been so good that nobody could tell they were brushes! We’ve tried to make the birds as big as possible so you’ll get the maximum use out of them, we’ve also tried to keep their in flight spacing as natural as possible, unlike other bird brush packs we’ve seen and used where the birds have been rounded up into ‘pretty flocks’! We’ve ended up with a whopping 50 brushes of varying sizes, mostly 2000px wide. We include several birds in trees brushes for instant images which could be used by scrapbookers and graphic designers for t-shirts and general printed business cards etc. To change colours simply click on the foreground/background colour boxes on your left hand Photoshop side panel to open up the colour picking panel. Save the file in your normal place for textures etc. like downloads or documents. To install the brushes either double click the unzipped file to install whilst your Photoshop is open on your desk top, The brushes will appear at the end of their current brush set. Alternatively, Open Photoshop, click on the brush tool then click on the small arrow at the right of the brush size in the upper menu bar, click on the settings “gear” icon in the upper right of the window that opens, select Load brushes and navigate to where you stored your downloaded brushes. Please note, its best if you know how to use brushes before purchasing, though they’re very simple to use, simply select a brush, and “stamp” on an image, of course you may have to adjust the brush size to suit. These brushes were created in Photoshop CS4 – the oldest photoshop version we could get our hands on, so this means that any Photoshop from CS4 onwards will be able to use this new brush set! This entry was posted on Tuesday, January 31st, 2017 at 1:04 am. It is filed under Blog and tagged with birds, brushes, flock, flying, launch, photoshop brushes. You can follow any responses to this entry through the RSS 2.0 feed.